The Indian Embassy in Nepal on Sunday informed that nearly 200 Kailash Mansarovar Yatra pilgrims were stranded due to inclement weather conditions. In a statement, the Indian embassy said, "Our headcount on the evening of August 4 revealed that there are 124 pilgrims in Simikot and 50 others in Hilsa or about to come to Hilsa." The embassy noted that Simikot had basic boarding and lodging facilities to hold up to 500 pilgrims, adding that there were also facilities of initial medical examination and first aid. It said that the numbers were not alarming and would take just one day of good weather and normal conditions suitable for flights to evacuate all those stranded. The embassy further said, "The Mission's representatives in Simikot/Hilsa/Nepalganj are on alert and continuously monitoring the situation. In case of any emergency, the Mission would ensure safe and timely evacuation of stranded pilgrims." An emergency control room, with contact numbers of embassy officials, has also been functioning 24X7 since July 2 to cater the need of the stranded pilgrims and their family members' queries. It has been equipped with eight-member multilingual personnel (Hindi/English/Tamil/Telugu/Kannada/Malayalam language speakers) to avoid language barriers. 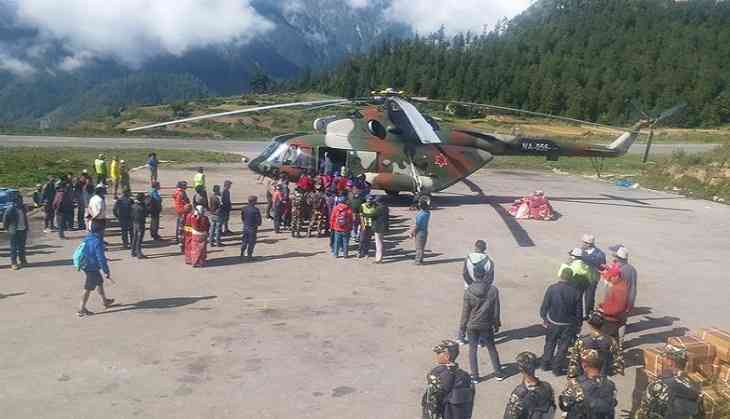 A number of Kailash Mansarovar Yatra pilgrims have been stranded in parts of Nepal following a recent heavy downpour. Thousands of Indian pilgrims take part in the yatra every year via Nepal in the Tibetan Autonomous Region of China ahead of the monsoon season. The tour is organised by the Ministry of External Affairs (MEA) each year between June and September, in cooperation with the government of the People's Republic of China through two different routes - Lipulekh Pass (Uttarakhand) and Nathu La Pass (Sikkim). 70,000 किसानों को मोदी सरकार के खिलाफ सड़क पर उतरने की जरूरत क्यों पड़ी ?